I was traveling by both Vistadome and Backpackers, one trip each, and found seats of Backpackers more comfortable! There is no direct road between Cusco and Machu Picchu. From Cusco roads end at Ollantaytambo (which lies in between Cusco and Machu Picchu). Next 30 km (from Ollantaytambo to Aguas Calien tes/Machu Picchu) only transport is train. So you can reach Ollantaytambo by bus or taxi and then Machu Picchu by train. 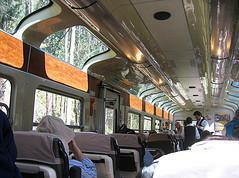 But the popular way is taking the direct train between Cusco and Machu Picchu. There are two train stations in Cusco. Trains from Machu Picchu leave from San Pedro station, at Calle Cascaparo (at intersection of Cascapara and Santa Clara) . Trains for Arequipa leave from Wanchac station at Ave Pachacutec. San Pedro is only 5 blocks from Plaza de Armas. Another important thing is that if you buy the tickets through website ( previously you couldn't, but from March, 2008, you can buy directly from website using Visa card) then must keep the printout of the payment receipt ( or as they call it - 'e-voucher'), and show it in Sun Pedro to get the embarkation ticket. Peru rail (the only train company in Peru) is offering currently three train services from Cusco to Machu Picchu. Don't take the direct train from Cusco, reach first Ollantaytambo, then take the train from there. Now I can mention three very good reasons for this advice. First you can save lot of money this way, second you can spend some time in this good tourist spot ( spending no extra money for traveling), third one is very important, during high season you need to buy your ticket two/three days prior to your departure form Cusco, which is not always possible. Don't be scared if tickets are unavailable from Cusco, follow my advice and take this alternative tour and reach first Ollantaytambo, tickets are more available here, because there are lot more trains run from Ollantaytambo. This is the most elegant service provided by Peru Rail. 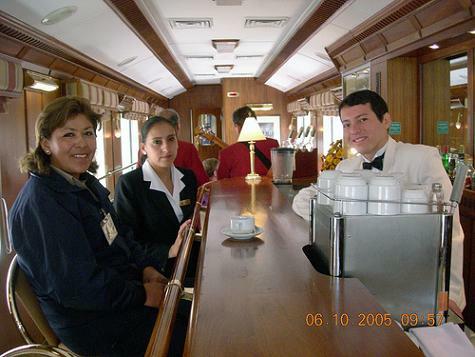 Hiram Bingham Service, named in honor of	Hiram Bingham, the American explore, is the most expensive service of Peru rail. Round trip will cost you $588.00. 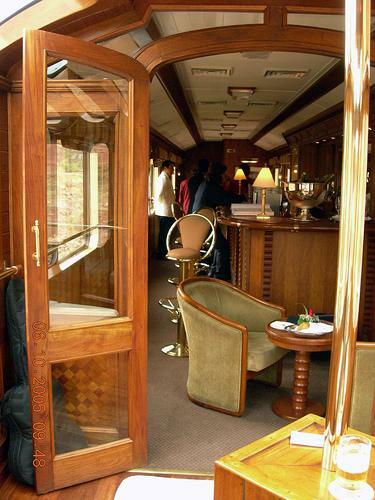 If you like luxury, you will like the journey in this train. 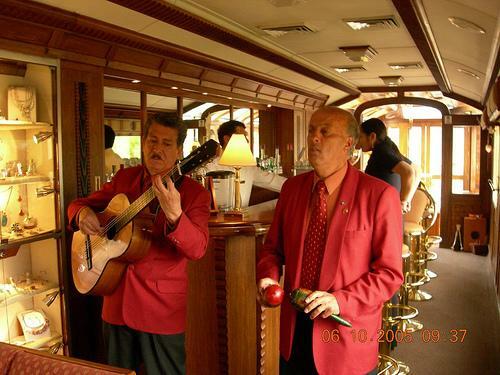 It offers variety of services and certainly the train journey by Hiram Bingham is a memorable experience. One advantage with Hiram Bingham is that, it leaves a little late in the morning, so you don't have to hurry too much in the morning. (At least that's what they say, but to me it is a disadvantage. If you start late, you reach late, so you can stay less time there.) They provide brunch while going to Machu Picchu and also dinner while coming back. Previously you could not buy your ticket through website, you could only book and then you have to be present in Cusco to buy your ticket. But now you can buy your ticket in website. But once you buy the ticket from website take a print out. This print out is not enough to do your journey. You have to show this print out or e-voucher for the	embarkation ticket. You have to be in the station at least one hour before departure of the train to get the embarkation ticket. Once you start the journey, you would find it elegant. In the journey they will provide-welcome drinks, water, tea, coffee and an excellent wine selection, brunch on out-bound journey, musical entertainment on board, professional tour guide for every 15 passengers, access to the sanctuary of Machu Picchu, exclusive transport to and from the Sanctuary, afternoon tea at Machu Picchu Sanctuary Lodge, cocktails and dinner on return journey. Vistadome runs from Cuzco up to Aguas Calientes. Then you have to take a bus ride to Machu Picchu. Bus ride is the easiest part. Rate of Vistadome is 142.00 $ (return journey), As I mentioned earlier in Vistadome the windows are bigger so that you can enjoy the panoramic view. And at rooftop it has windows too (to enjoy the scenic beauty). Vistadome also offers snacks and hot drinks. It offers almost the same service. Fare for Backpacker is 96$ (return journey). They provide snacks. (But no drinks- don't forget it is 46.00 $ less for a single person). Additional storage space is available for backpacks. If you want my recommendation, I would suggest this one. Save the money to spend on something else.